Celebrating the life of Johnnie Lewis Blakey "John"
Obituary for Johnnie Lewis Blakey "John"
Johnnie Lewis Blakey, 64, of Culpeper, Virginia, passed away April 27, 2018, at Piedmont Hospice Center in Charlottesville, Virginia. He was born January 24, 1954 in Madison, Virginia, to the late Johnny and Dolly Frye. He was the oldest of 13 children. 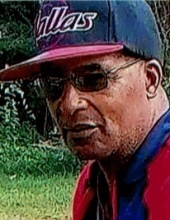 He is survived by a special friend, Becky Weaver of Dale City, VA; one daughter, Bertha Latoya Jasper (Alazer) of Charlottesville, VA; one son, Briscoe Jasper of Culpeper, VA; two grandchildren, Rebekah and Dashawn; and five sisters, Lydia Blakey of Ruckersville, VA; Martha Frye of Stanardsville, VA, Clara Frye-Minor (Danny) of Culpeper, VA; Wanda Jackson and Donna Frye of Orange, VA; three brothers, John I. Blakey of Culpeper, VA; Dave Frye (Sally) of Culpeper, VA; Anthony Harvey (Tonya) of Richmond, VA; four uncles, Bradley Frye of Washington, DC, Bobby Blakey and Charles Carpenter of Madison, VA; Roger Blakey of Charlottesville, VA; four aunts, Dorothy Blakey and Fannie Carpenter of Madison, VA; Mary Jones of Wolftown, VA, and Betty Turner of Culpeper, VA; and a host of nieces, nephews, family and friends. In addition to his parents he is preceded in death by his sister Kathy Frye and brother Harry Blakey. To send flowers or a remembrance gift to the family of Johnnie Lewis Blakey "John", please visit our Tribute Store. "Email Address" would like to share the life celebration of Johnnie Lewis Blakey "John". Click on the "link" to go to share a favorite memory or leave a condolence message for the family.